Diwali is a happy time but also the most accident prone day. There are all reasons for accidents to occur- Diwali diyas, candles, firecrackers- fire in all forms is present everywhere. However, with a little care and precaution, we can always enjoy a safe and happy Diwali. However, if there occurs some untoward incident and someone burns, use first aid and seek expert medical help. Here is what you can do to give first aid to victims of burns. Save Diwali helpline number 09312377554 in your mobile phone and write it in big letters and paste at the outside and inside of your house at a visible place. This is a Delhi based number. Find out the medical emergency number of your doctor/ hospital and save in mobile and paste at visible places. Before bursting fireworks, ensure to keep a bucket full of water handy. In any event of fire, howsoever small it seems, extinguish flame by pouring water from the bucket. Remember, all major fires are small when they start. If someone catches fire, don’t panic and act fast. Learn to differentiate between minor and major burns. In the event of minor burns, only the outer layer of skin is burned. The skin usually gets red with swelling and sometimes it is painful too. This is a first-degree burn. When blisters develop on the skin and it becomes intensely reddened with splotchy appearance, it is a second degree burn. It is accompanied with severe pain and swelling. If the second-degree burn is smaller than 3 inches or 7.5 centimeters in diameter, take it as a minor burn. However, if the burned area is larger or if the burn is on the hands, feet, face, groin or buttocks, or over a major joint, take it as a major burn and get medical help immediately. Major burns or the most serious burns, also called third degree burns, are painless and affect all layers of the skin, fat, muscles and even bones. It causes permanent tissue damage. If the burnt area becomes charred black or appear dry and white and if it is difficult for the victim to breathe properly, don’t waste time and seek immediate medical help. In the event of minor burns, hold the burnt area under cold running water for at least five minutes or until the pain or burning sensation subsides. Remember, the water should not be “too cold”. If the above is impractical to do, immerse the burnt area in cold water or cool it with cold compresses. Cooling the burn conducts heat away from the skin and reduces swelling. Cover the burnt area with a sterile gauze bandage. Don’t use fluffy cotton. It may irritate the skin. Always wrap the gauze loosely so that it doesn’t put pressure on burned skin. Bandaging helps keeping air off the burned skin, reduces pain and protects blistered skin. Do not use ice. The wound takes longer to heal when ice is applied on it. Don’t use ghee, oil, butter or any ointment etc. on the burn as it increases the risk of infection. Don’t break blisters, it may cause infection. Minor burns generally do not need any further treatment. However, watch for signs of infection which include increased pain, redness, fever, swelling or oozing. In case of infection, seek medical help. To put off the intensive fire, make the victim roll on the floor with a blanket. Call medical emergency number. 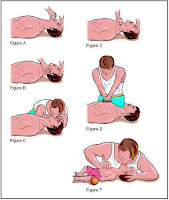 Until medical help arrives, take the following steps. After extinguishing fire, make sure that the victim is no longer in contact with smoldering materials or exposed to smoke or heat. However, don’t remove burnt clothing. Don’t immerse severe burns in cold water. It can cause shock. Elevate the burned body part or parts. If possible, raise them above heart level. Cover the burn area with a cool, moist, sterile bandage or a clean, moist cloth. You can even use moist towels for the purpose.